Canada/Ottawa: Pfizer Canada, a Kirkland, Quebec establishment, issues a warning for an unknown number of EpiPen and EpiPen Jr Auto-Injector Device Pens due to suspected failure to extricate the drug product from its packaging tube during an emergency and consequential failure or delay in administering Adrenaline (Epinephrine) to patients during Anaphylaxis, all serious health and safety hazards. Please consult the photograph above for details of the product’s packaging, design and retail presentation. Additional images of the Auto-Injectors can be found on the Web site above. According to Health Canada, Pfizer Canada has advised Health Canada that some EpiPen (0.3 mg) and EpiPen Jr (0.15 mg) Auto-Injector devices may not slide out of their carrier tube easily, or at all. This could delay or prevent emergency treatment, possibly leading to patient disability or death. According to the company, the device label has been improperly applied to a very small number of the Auto-Injector devices in a way that the device label may become stuck to the inside of the carrier tube. This could mean that the device does not slide out of the tube as easily as expected. The issue is with the device label, and not with the device itself or the drug that it delivers (Epinephrine). EpiPen and EpiPen Jr are used to deliver an emergency treatment of Adrenaline (Epinephrine) to patients who are at risk or have a history of life-threatening allergic reactions (Anaphylaxis). 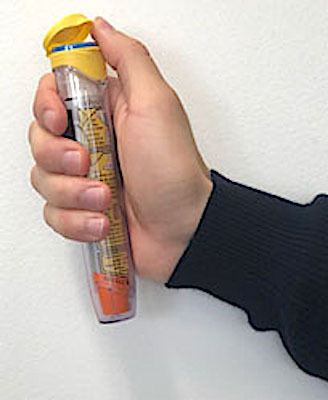 These EpiPen and EpiPen Jr products are not being recalled by Pfizer, as the risk can be mitigated easily by pharmacists and patients by checking devices before an emergency situation arises to make sure the Auto-Injectors move freely in their tube and easily slide out to administer the drug. ==> Health Canada reminds Canadians of the ongoing supply disruptions of EpiPen and EpiPen Jr Auto-Injectors and that alternative products, specifically the Auvi-Q (0.3 mg and 0.15 mg), have been made available through an Interim Order. Check your Auto-Injector devices to make sure they slide out easily from their carrier tube. To check the device, flip open the carrier tube cap, gently turn the tube upside down and let the device slide out into your hand (do not shake or drop it). Visually inspect your device to make sure the device label has no unglued edges that may catch on the tube. DO NOT REMOVE the blue safety release from the Auto-Injector device. The blue safety release should be kept on the Auto-Injector until the time of use. Return the EpiPen device to its carrier tube and close the carrier tube flip cap once you have confirmed that your Auto-Injector slides out easily and that the device label has no unglued edges. If you are unsure about how to check your Auto-Injectors, your pharmacist can check your device for you at the dispensing drug store or pharmacy. If your device sticks or does not slide out easily from its tube, or the device label has unglued edges, return it immediately to your pharmacist for replacement. DO NOT attempt to remove or re-attach the label under any circumstances. ==> To see other recalls and notifications caused by suspected contaminated, adulterated or mislabeled drugs, please search for “drug” using the Search Box at the top of this page. ==> To see other recalls and notifications for products manufactured, marketed and/or sold by Pfizer Canada, please search for “Pfizer” using the Search Box at the top of this page. Want to e-mail or share this warning? Is this warning relevant to you? Please let us know!